Harmon's is the go to solution for many area hotels and event centers. Listed below are locations where we are the preferred vendor for your audio visual needs. Conveniently located in downtown Ft. Myers, Harborside is the only event center of its kind in the Ft. Myers area with 42,000 sq. ft of exhibit and event space. Nestled in the heart of Southwest Florida on the shore of the Peace River, the Charlotte Harbor Event & Conference Center offers 44,000 sq. ft of event space, pristine water front views and top food service management for events of all sizes and budgets. As the name would suggest, the Holiday Inn Airport is located in Ft. Myers close to the SWFL Int. Airport. With special packages for meetings and events contact them today to arrange your next meeting. Plan your next corporate event or meeting in one of our resort’s nine meeting rooms housed with comprehensive audiovisual capabilities. Sundial Beach Resort and Spa’s meeting facilities include 12,000 square feet of indoor and outdoor space – the only destination on the Florida Gulf Coast of Sanibel Island capable of accommodating up to 300 guests. 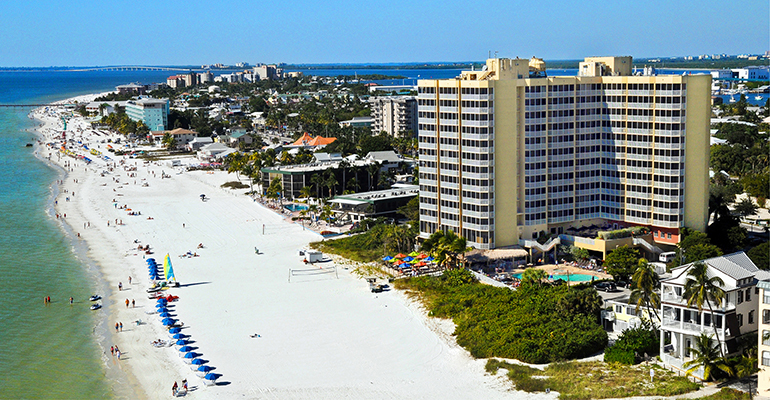 If you are looking to have your event on Ft. Myers Beach, this is the place to be. The accommodations include: 8,000 sq. ft of meeting space, including an executive board room, ballroom & outdoor terrace overlooking the Gulf of Mexico.